What's better than freshly hand-picked fruits and veggies from the farm? Nothing that we can think of! But, do you have the time and access to drive to your local Farmer's Market at the same time once a week? With GrubMarket, you can buy the exact same produce, meats, breads, and artisanal goods from the exact same farmers and artisans that you'd see at your local Farmers Market - and have them delivered straight to your door! Small farmers love to work with us because it gives them the ability to plan ahead, rather than try to fulfill an unknown demand at the market every week. By choosing GrubMarket, you also help the planet. Our delivery service removes thousands of cars from the road, as well as plastic bags from our landfills and oceans (especially when you select our reusable packaging options like our eco-baskets or tote bags). On top of that, GrubMarket is on its way to become a Food-Waste Free company! Our farmers harvest after you order, which means that we never keep extra stock of our fresh goods, so nothing goes to waste. If an order is cancelled or if we end up with a surplus of any items, we donate them to charities like Alliance of Moms or our partner food banks. Find everything from your local natural food grocer and Farmers Market combined, so you don't have to make that trip to the grocery store - we even have pet food and cleaning supplies! When it all comes down to it, the most important reason to shop with us is that it’s easier for you and your family. Just place your order and let us take care of the rest! Easy as pie! Just click the "Register" button at the top of our homepage to create your free account. No: commitments, membership fees, or limitations. Simply order what you want, and we'll deliver it! You can also place your order over the phone by calling (888) 888 8590, or send your order via email to socal@grubmarket.com, seven days a week! Many of our fruits and vegetables are certified organic. GrubMarket is a proud supporter of the local food movement and we prioritize sourcing from small local farmers. Many of these farmers do not yet have their organic certification, which can be an expensive and lengthy process. Regardless of certification, we require that our farmers use sustainable growing methods. This means they never spray their crop with chemicals like pesticides, herbicides, or fungicides, and they don't use GMO seeds. We identify these non-certified farmers on the website as "Local and Sustainable" - you'll see this term included in the product descriptions throughout our store. By supporting GrubMarket, you are supporting these small local farmers on the path to becoming financially independent and potentially obtaining their organic certification. The more local farmers we support, the more we encourage future sustainability in our communities. We know how our food is grown and who grows it... can't get much better than that! How will you package my orders? Our website’s "checkout" feature is time based. 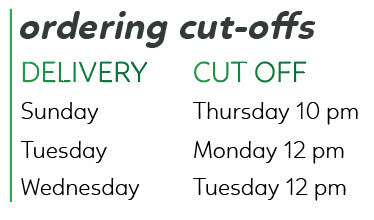 This means that for each day we deliver to your area there is a cut-off time to order and you can change your order as many times as you’d like up until that cut-off time. For this reason we have an “update order” button instead of a “check-out” button. You can enjoy the convenience and flexibility of changing your order as life happens. Fill up your order and change it as much as you need to throughout the week. Anything left in your order at the cut-off time will be charged and delivered. When are the cut-off times for ordering? Some of our special handmade and artisanal products take longer to prepare and may have another specific cut-off time to order. Be sure to look out for that info in the product listing! You can check the cut-off time of your upcoming orders here. We created FarmBoxes to provide our customers with a rotating selection of seasonal and artisanal products that are catered to your household's size and preferences (including dislikes and allergies). We source the contents of our FarmBoxes from local farmers and artisans, so you'll see a great variety in the items you receive each week. What is truly special about these FarmBoxes is how they help our farmers. When a farmer yields an unexpected surplus of an item, our main goal is to put it in our boxes. The flexibility of buying what's available from our farmers and letting Mother Nature take the reins is highly effective in reducing food waste within the local food system. This flexibility extends to our customers as well: each FarmBox is customizable so you can swap items you don’t want to receive! Can I customize my FarmBox? Absolutely! If you have any food allergies, or if you don't like certain items, just add them to your Dislikes list under your account preferences and we will always substitute them with another seasonal item for you. If you want even more control, you can swap items in and out of your FarmBox from a curated list of available produce from our farmers that appears directly in your FarmBox. FarmBox contents are published every Tuesday afternoon on our website in the product listing by clicking the what’s inside button. You can also view FarmBox contents in your shopping cart if you have added a FarmBox to an upcoming delivery listing by clicking the customize bag button. Besides your FarmBox you can also order items individually or a-la-carte. What if I am allergic or do not like a certain produce item? We got you covered! You can add up to 5 items that you'd prefer to never receive in the Dislikes section of the registration page. You can edit this list at any time within the preferences section in your account profile. We will always substitute any item(s) within your dislike list if it's included in a FarmBox or a Recipe Kit that you order. However, we will not substitute any dislikes if you order the item a-la-carte. That means if you specifically select an item that is in your dislikes list we will not substitute it. Have more than 5 dislikes? No problem! Simply call or email us and we will add the additional items to your dislikes list. Nope! You can order whenever it best suits your schedule and needs. While you can set your FarmBox and/or personalized a-la-carte order to come on a recurring schedule, you can also order anything at any time you want for a one time only delivery. Just fill up your cart whenever you want a delivery, and we'll deliver it! Can I place a subscription/recurring order? You can order anything on our store page and set it to your desired frequency the first time you order, and our system will automatically recreate your order at the frequency you designate. You can even specify which items you want at different frequencies. For example: You can set up your produce to come every week, eggs every other week, and that chocolate bar as a special monthly treat. What you order, and the frequency, is entirely up to you. No commitments, no frequency requirements, and no limitations. Of course! You're always welcome to order over the phone by calling (888) 888 8590, or send your order via email to socal@grubmarket.com. Our Customer Care hours are Mon-Fri from 9:00 am to 5:00 pm, and Sat-Sun from 9:00 am to 3:00 pm. We love hearing from you and making sure your order is perfect each time! After logging in to your account, you will be directed to the Upcoming Deliveries page. 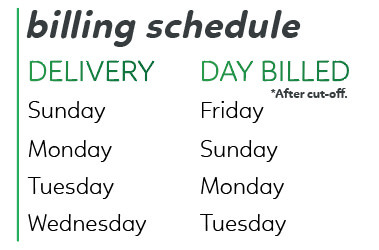 Here, you'll see future available and scheduled delivery days. If you leave this page to shop, you can access it again by hovering your mouse over My Account at the top right corner of the screen, then click on Upcoming Deliveries and you'll be able to view your orders again! How do I skip deliveries? Go to the Delivery Hold page via My Account. Here you can enter the date range in which you want to skip deliveries then click "Add Vacation”. Afterwards you will see the dates appear below. Please note that the last day of your vacation hold is still considered a part of the pause, so you will not get a delivery that day. If you would like your deliveries to resume on the day you return from your vacation, schedule the returning date to the day before. Currently the SoCal Hub of GrubMarket is servicing the greater LA area and parts of Orange County. Check out our delivery area map to find out if we deliver to your neighborhood. We're constantly growing and expanding. If your home is out side our delivery area zone please visit our NorCal Hub which services the rest of the country. What day of the week and time will you deliver my order? Will I be notified when my delivery is in route? Yes, you will be notified via text message when your driver is in route from the previous stop (between 5 and 30 minutes away). You’ll receive another text message when your driver has arrived. If the driver’s previous stop is in very near proximity to your home or office you may just receive the message that your driver has arrived. Do I need to be home when you deliver to me? We do recommend that you be home so you can immediately put your produce away, but it is not required. If you’re not home, we will leave your order on your doorstep or in any specified location per your instructions. If you live in a gated building or community that requires you to be home for delivery please call or email us so we can ensure that we will be able to deliver when you are home. What if you can't leave my groceries at my door? We deliver to a variety of different residences and businesses all over Southern California and we are happy to work with everyone's needs. Please share with us any instructions that you feel would be helpful to make a successful delivery, such as a gate code, a back entrance, to leave with a neighbor, if you have limited mobility and need assistance to bring in your order. We also have a key program for those who are comfortable in giving us a spare key to a house or building gate, which is completely optional. If you would like to sign up for our key program, please email us at socal@grubmarket.com. Eco-Baskets are cushioned, sturdy, and insulated; they make a great home for your fruits and veggies while they're in transit. We line them with ice packs, so if you're not home when we arrive with your delivery, everything inside will stay cold for up to 4 hours in the shade and much longer depending on the outside temperature. They're also great for those who don't want to create waste. We pick them up each week, clean, and re-use them. By using our Eco-Baskets, we save 70,000 plastic and paper bags from going into landfills each year - we think that's pretty awesome! When do you pick-up our Eco-Basket/grocery bag and other reusable items? We pick up all your reusable materials (baskets, bags, insulated envelopes, and ice packs) when we arrive with your next delivery. Be sure to leave them out the night before if possible as we deliver to some areas as early as 7am. 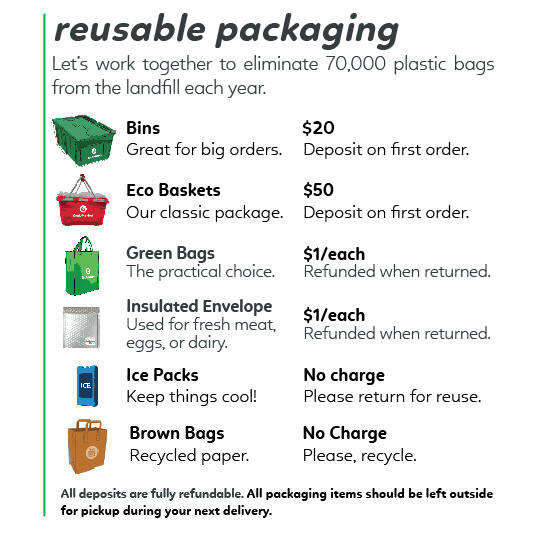 We never charge before the ordering cut-off or while you're on a vacation hold unless the charge is for unreturned reusable packaging items. Will I incur any cost (i.e. : delivery cost) other than the cost of my groceries? Delivery is free for all orders over $50. A delivery fee of $4.95 is applied to any order under $50. We offer reusable packaging for which we charge deposit fees. Please see the options below. Why am I seeing $1.00 or $2.00 charges? GrubMarket reuses and recycles most of our packing materials. Whenever we send out insulated envelopes or reusable bags, we charge $1.00 for those materials. However, when that item is returned, a $1.00 credit is then credited back into your GrubMarket account, which will go toward your next order. The cost always evens out as long as your materials are returned. You can see these charges reflected in your Delivery History. What if I am not satisfied with an item in my order? Please call or email us, and we will either credit your account or re-deliver the item to you as soon as are able to. We will always let you know what your options are and we always strive to ensure 100% customer satisfaction regarding our products and our delivery service! When can I reach the Customer Care team? You're always welcome to call and email us any time! Our Customer Care team is open Mon-Fri from 9:00 am to 5:00 pm, and Sat-Sun from 9:00 am to 3:00 pm. If we don’t pick up, leave us a message and we’ll get back to you within 24 hours. We're here to help and we love hearing from you! Can I purchase a FarmBox as a gift? Absolutely! We have an assortment of curated Gift FarmBoxes, perfect for celebrating any occasion - you'll find all of the gift options we offer here. You can also pick and choose anything from the site to be delivered as a gift! The best way to create a gift order is to register a new account (even if you already have one). Be sure to fill out the Gift Recipient Name and Gift Card Message fields during registration and also accessible within your account preferences. Enter your own personal contact information (phone number and email), and your gift recipient's delivery address, and choose how you'd like your gift packaged. We offer a special $20 gift price for the Eco-Basket! And as always, you're more than welcome to call us if you have any questions or special requests! Please find our Gift Certificates here. Just fill out the form and send it to whomever you please! Your gift recipient will receive their gift certificate via email within minutes. How many days in advance do you need to pause or cancel my order? If you place a vacation hold or delete your order before the ordering cut-off time your order will be canceled in time and you won’t be charged. You can skip your delivery before the ordering cut-off time by logging into your account and deleting individual orders, or by adding a delivery hold to your account. You may also call or email us to cancel your order. If you weren’t able to cancel your order before the cut-off please call or email us. In an effort to minimize food waste we encourage you to cancel before the cut-off whenever possible, but we do understand that unforeseen events happen to everyone. We offer one complimentary cancellation past your ordering cut-off time. We are always happy to gift your order to a friend or family member, or donate it to one of the local charities we support, like Alliance of Moms. How do I cancel my GrubMarket account? If you need to cancel for any reason, please email us at socal@grubmarket.com or call us at (888) 888 8590. If you need to pause your account for a specific period of time, we recommend putting your account on a vacation hold so you don't have to register again upon your return, click here[ to FAQ question “How do I skip deliveries?” pg. 3”] for more information on placing your account on vacation hold. Who can I talk to about setting up an account for my business? Click here to contact our Business Accounts Team.